Hoisting licenses are required in many states for anyone who operates heavy-lifting machinery. Hoisting machinery simply is defined as any equipment which lifts, moves and suspends material, typically construction material, in the air. These types of machines typically include cranes, derricks as well as temporary elevator cars operated on excavation sites. Hoisting using heavy machinery can be dangerous for anyone on a work site, so that's why states have licensing procedures in place. 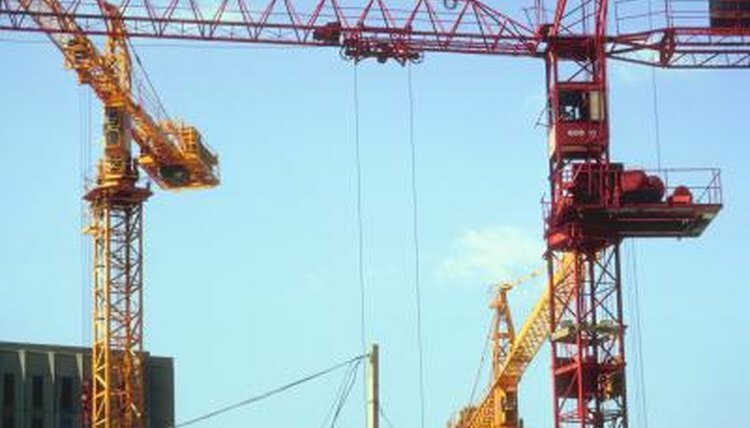 Complete a state application for a hoisting operator's license. Though they are typically available online, you can also call the local state licensing office for a hard copy. List your qualifications and experience. Make sure you have the appropriate amount of work experience with similar hoisting equipment. Some states require no less than one year and 1,000 working hours per year to get a hoisting license. Complete and pass a physical examination. Have the physician who administers the exam provide you with written documentation of the exam. Pass a written examination administered by the state. Follow up with the state licensing agency directly on examination test times and locations. The exam typically tests knowledge of hoisting machines, safety procedures, equipment safety as well as state-specific laws and regulations. Look for listings of the laws and regulations in your state online or at your local library. Consult books or sign up for training courses to help you prepare for the test. Provide a notarized certificate of experience. The certificate must be signed by a supervisor or another person who has knowledge of your work experience. Cole, Mary. "How to Get a Hoisting License." , https://legalbeagle.com/8793102-hoisting-license.html. Accessed 24 April 2019.